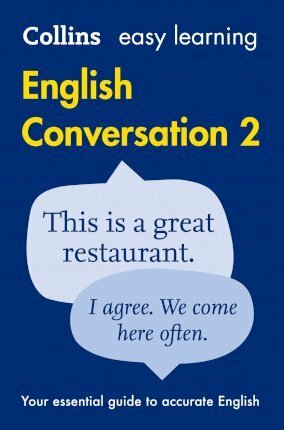 Collins Easy Learning English Conversation: Book 2 is a unique guide to communicating in English. Building on the phrases and vocabulary learnt in Book 1, it has been specially designed for intermediate-level learners who want to communicate successfully and with confidence in everyday situations, at work, or when travelling or studying. The text consists of 14 units, each illustrating the language used in a particular situation. The topic-based units cover the language learners need in everyday situations, but also language for more formal situations, such as a seminar or business meeting. Each section contains a list of the most useful phrases, with information on where and when they should be used, and a short sample of a conversation, showing the learner how a typical conversation flows in English. An audio CD contains all the conversations from the book, and allows the user to practice what they have learnt. In addition, the supplement contains all the everyday expressions and language structures that learners need to speak in natural English, organized by function. Each section also contains a glossary of useful vocabulary, making Collins Easy Learning English Conversation: Book 2 an indispensible resource for students who want to build on their conversation skills so that they can speak English fluently and with confidence.